Wetting rate : Sufficient wetting rate of the heating surface by liquid is extremely important for trouble free operation. Apart from the heating tube dimensions, it is very important to choose a suitable distribution device to achieve full wetting. Due to the low liquid content and high flow velocity in the heating tubes, the residence time of the product is very short. This not only reduces heat injury to the juice but also scaling intensity is reduced. Wetting rate is also known as juice loading per unit area of perimeter. Flow of juice or syrup for each tube : When the calculation of a multiple effect has been completed with the dimensions of vessels and their tubes, and the number of tubes, it is advisable to verify the flow of juice or syrup for each tube. Generally, for regular operation, it is necessary to maintain 40 kg/h of juice or syrup per tube, calculated on the quantity entering the vessel. This rate is easily attained for the first vessel, but not for the later ones. Where it is not reached, it is necessary to provide for recycling juice between the outlet and the inlet of the vessel, in order to assure complete wetting of the tubes and avoiding periods of operation with partly dry tubes at times of low juice flow. The rate of 40 kg/hr/tube is considered as optimal, and the recycling pump is calculated on this quantity. Kestner evaporators work better if the flow per tube (51 mm tubes) is kept above 80 kg/h (Rein and Love 1995). The rate of fouling is also reduced all this flow rate, leading to the theory that low flow rates per tube can lead to partial dry-out of the heating surface. In some cases a recirculation line is installed on Kestner to achieve these rates However, in Robert and Kestner and evaporators, there is no need for any control systems to keep the tubes wetted. In Falling Film Evaporators require uniform and adequate wetting of the tubes and so need the complication of juice recirculation and a distribution system feeding equal quantities of juice to every tube. An emergency water feed to the evaporator is also required, in case the juice supply fails; the absence of adequate feed even for a short time can lead to severe fouling of the tubes. The main problem, with a descending-film evaporator, is the distribution of juice on the upper tube plate. It is necessary that all tubes from this plate, or from one section of the tube plate, should receive the required volume of juice so that the juice is distributed only in a thin layer around the tube, and that no section of tube remains dry at any moment. where Q is the weight of juice in kg/hr , n the number of tubes, and d diameter of the tube in mtr. The optimum value varies from 500 to 600 kg/hr/m of circumference of tubes, to a maximum of 1200 to 1500 kg/hr/m. The falling film tubular evaporator has to have a minimum flow rate through each tube, and needs a pump-around system to recirculate liquid. This requires a level of liquid held in the sump of the vessel and a control system to ensure that the required liquid flow to the distributor is achieved. The falling film plate evaporators need a similar system, although the wetting rate required is lower. Generally 8-16 L/cm/hr in a falling film tubular evaporator in the beet industry and for falling film tubular evaporators in the cane industry, a much higher wetting rate of 12 to 15 L/cm/hr is recommended. Good juice distribution is the key to good performance from falling film evaporators. The constant wetting of the heating tubes with juice is of great importance for a trouble-free operation of a falling film evaporator. The wetting is indicated by the wetting rate W (l/h.cm). Wetting rate sometimes can also defined as Kg/ meter-sec. ID = ID of the tube in cm. 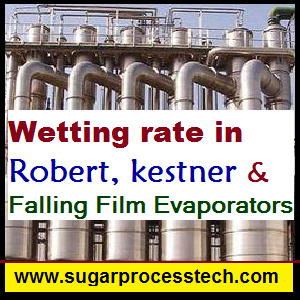 According to author Falling Film evaporator Wetting factor to be maintained minimum 2000 Lt/hr/m. According to that we can calculate capacity of circulation pump. Definition in steam properties like enthalpy, sensible heat , latent heat, total heat, supersaturated steam and also given steam table for saturated steam. 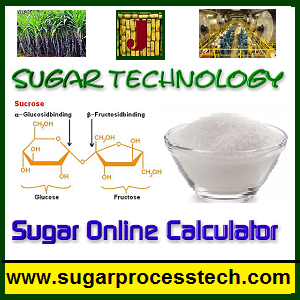 Formulas for calculate vapour line dia for juice heater and evaporator and also proved online calculator. In this I this my opinion is if we have provided correct wetting rate for Robert and Kestner evaporators than we can run evaporators with or without control system. In case of FFE evaporator compulsory need control systems. Its my personal opinion tell me about your opinion. I got your point. My concern was about Robert evaporator only.You mean to say maintain wetting number for Robert bodies 40 ltr/tube/hr. I agree for it. Shah and pickok has presented their work on Google.They have also found this figure. How ever evaporator automation is required to maintain steady operation without concentrating in some body having more heating surface.Hence pl recommend evaporator automation. 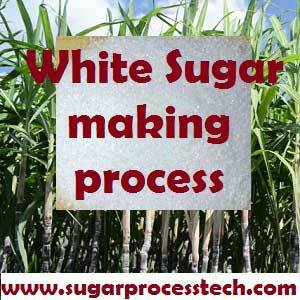 According to your interest I requested Mr. Kulkarni submit one article from sugar industry technologies. 1. Pump shaft to FFE inlet elevation. The information on wetting rate is really useful. 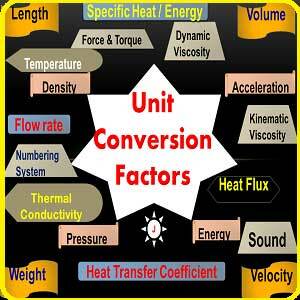 FFE,s evaporator wetting information is very good plz calculation of Circulation pump in detail.